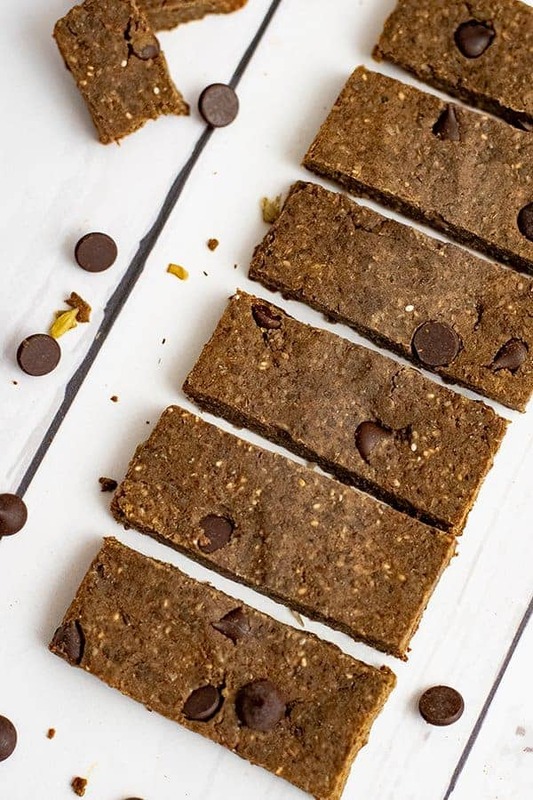 These 6 ingredient vegan granola bars are the perfect on the go snack that requires absolutely no baking! 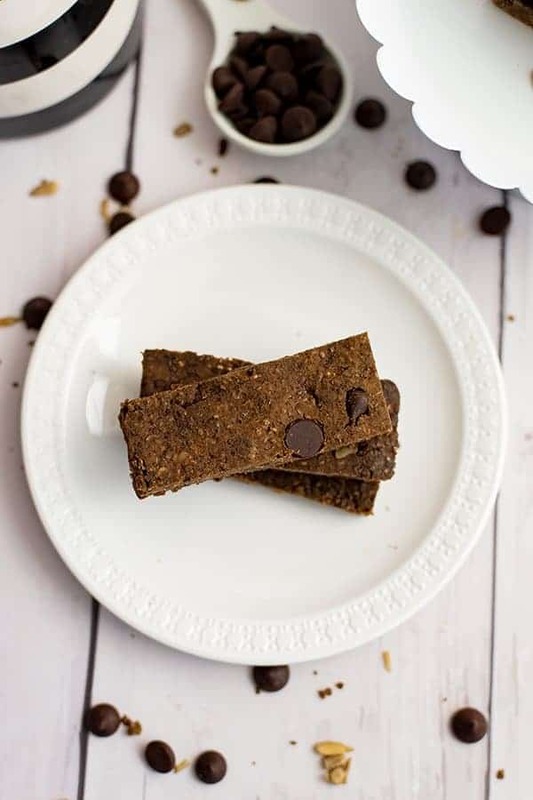 Vegan, gluten free, nut free, allergy friendly, packed with protein and super simple to make! All you need is a food processor and a few simple ingredients! When I was in high school and college I used to eat granola bars and Special K cereal like it was my job, thinking these were healthy options for breakfast and snacks. Once I started paying attention to my body, I realized was that most of the time those granola bars were just a quick hit of energy, but didn’t sustain be for very long. Eventually I found “protein” granola bars and “fiber” granola bars but slowly started to understand that the ingredients in those bars were far from ideal or healthy. Plus those store bought granola bars were often loaded with sugar, syrups and less than stellar ingredients. I’ve learned a lot about how big companies add ingredients that are not necessarily great for you in order to be able to keep up with the trends. Fiber that is very tough on your stomach and less than stellar protein sources (often GMO soy). 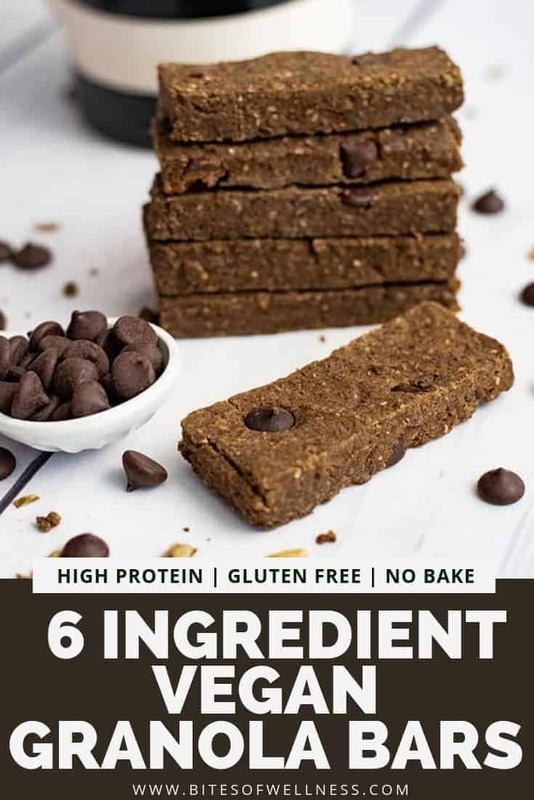 Once I became aware that the quality of the ingredients was something I needed to be aware of, not just what the marketing term on the front of the box claimed, I stopped buying most of these store bought granola bars. This is part of the reason I started to experiment in the kitchen, I knew there had to be a better way! I used to think that making vegan granola bars at home was something time consuming or extremely difficult. To be honest, I was making it a lot harder than it needed to be! But guess what, they are so simple! 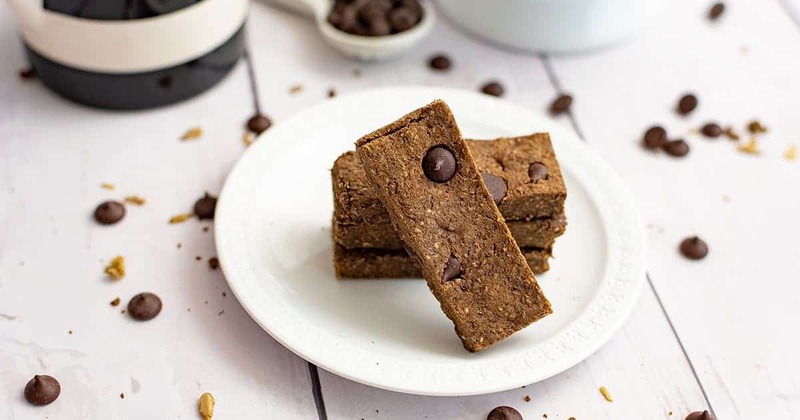 These 6 ingredient vegan granola bars are no bake and are great for on-the-go living, since they don’t need to be refrigerated to stay together! These ingredients are very similar to my energy bites! 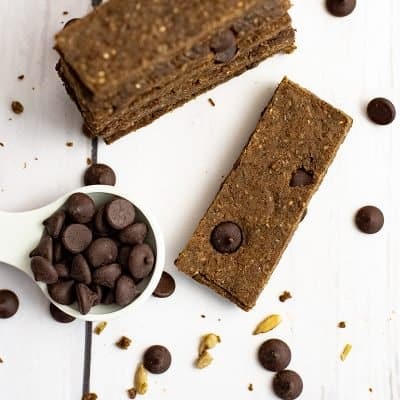 For more quick and easy no bake recipes just like this, check out these double chocolate banana energy bites, carrot cake energy bites, lemon blueberry energy bites or chocolate strawberry energy bites! Check the ingredients and the nutrition label! How much added sugar are in the granola bars? What are the main ingredients? Can you pronounce them all? Be wary of added sugar, syrups, soy based protein (often from GMO soy) and unnecessary flavors or dyes. Be aware of how you feel after you eat the granola bars! Do you feel even more hungry? Did you crave sugar more for the rest of the day? Pair your granola bars with a green smoothie or green juice to get in even more nutrients! If you are eating the granola bar for a meal, grab a green juice or make a green smoothie (with mostly veggies). This is a great way to make sure you are getting a balance of vitamins and minerals! Don’t forget to remove the pits from the dates!! To make these vegan granola bars easy to remove, place plastic wrap on the bottom of the casserole dish before adding the granola bar mixture. You can also use parchment paper! Use your hands to flatten the bars! It’s the easiest way to get them flat! If you find the mixture sticks to your hands, get a small bowl of water and quickly dunk your fingers in the water, this will keep the mixture from sticking to your fingers. Vegan protein powder – My favorite go-to brand is Nuzest (affiliate)! The ingredients are the best on the market. I made the switch to Nuzest when I found out that my go-to brand of protein powder was screening high in heavy metals and toxins due to heavy metals in the soil. 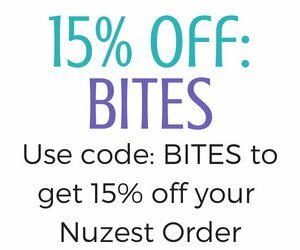 You can get 15% off Nuzest using the code below! 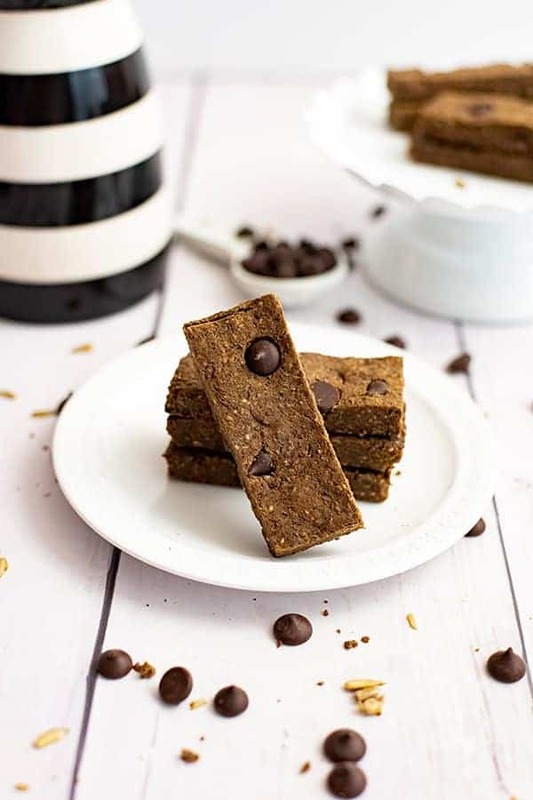 Vegan chocolate chips – I have recently discovered Pancha brand chocolate chips! They are so creamy and are so low in added sugar! I get mine on Thrive Market for a fraction of the price! Get 25% off your first Thrive Market order! 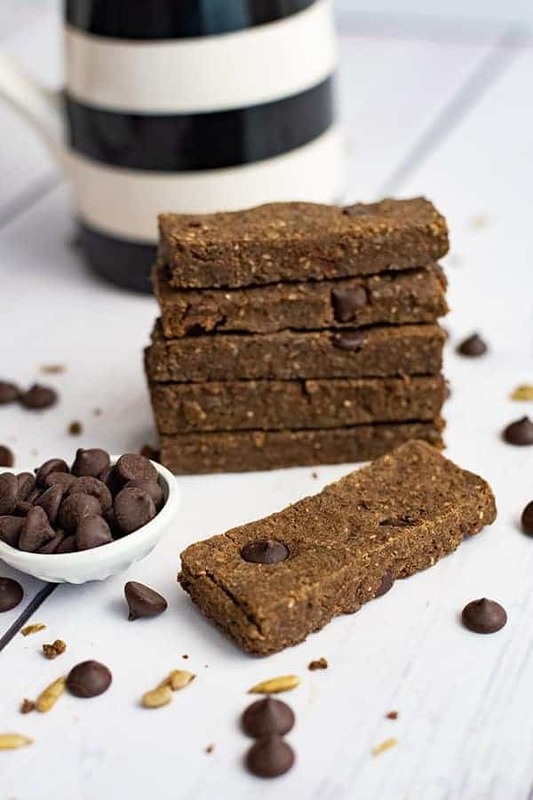 This recipe for 6 ingredient vegan granola bars is the perfect on the go snack! 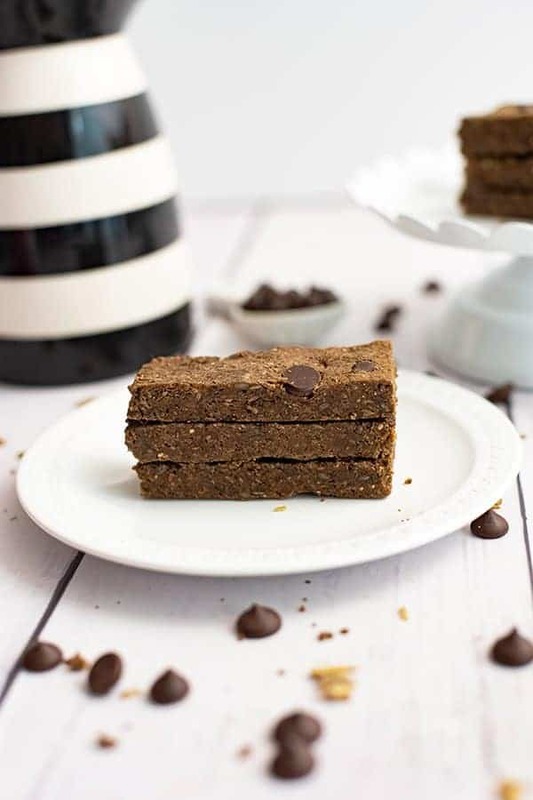 Vegan, gluten free, allergy friendly, nut free and simple to make! Soak the dates in hot water for 10 minutes (optional but allows them to blend easier). Remove the pits from the dates! Add the pitted dates and banana to food processor. Process on high until a thick paste is formed. Add the sunflower seeds (or nuts of choice) to the dates/banana mixture. Process on high until the seeds are mostly ground. It's ok if there are some chunks still, they will break down more as you continue. Add the chia seeds, protein powder and cinnamon (or vanilla extract). Process on high until fully combined. You may need to stop and scrape down the food processor. Add the chocolate chips and pulse to combine. Don't over mix. Use the back of a spoon or your fingers to press down the mixture, making sure it's tightly packed in. Refrigerate to set (about 1 hour). Cut with a sharp knife and store in a glass container or stasher bag. These dishes looking so delicious. I want all of them on my table. thank you for sharing this amazing dishes.